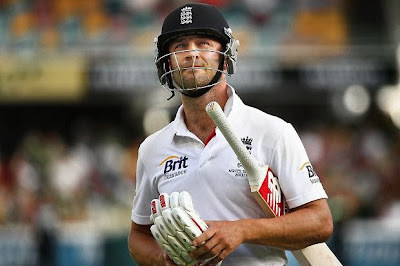 I am full of empathy and support of Jonathan Trott who is a key member of the England cricket team. He has been sent home early with a stress-related illness. Some of the press surrounding this has been great - full of concern, understanding, respect that he has been open enough to want to come home early to (I guess) get the help and support he needs. He may not have wanted to come home at all - but if it meant relieving him of some of the pain he is in, he would surely have preferred to walk away from the Series than carry on suffering. (I have suffered and it hurts like hell. You'd give up anything to make things less painful) Perhaps the decision was made for him for his own safety. 1 in 4 people have some sort of mental illness. So statistically thats 3 people in the cricket team - yet news of Trott came as such a surprise / as though things like this don't happen to people like him. Us 1 in 4 who are affected can hide it so well, which is why it can be so hard to tell. It reminds us that mental illness doesn't stigmatise - you can be famous / rich / young / world class at cricket and still be affected. Michael Vaughan has written a fantastic article about it in the Telegraph. Mike Atherton has also written a great article - but you have to be a subscriber of the Times to read it (which I am). Piers Morgan wrote some HORRENDOUS tweets about it - made my blood boil in fact. Not even worth posting here. What's worse is he has spent most of the day trying to scramble his way out of the hole he has dug himself. Fool. Its hard enough for Trott to leave early from one of the biggest / most historic sporting competitions he will have ever played in - its even HARDER for him to have to face horrific media coverage (apparently the Aussies have written some monstrosities) that stigmatises and criticises him for this. He has a mental illness. It is not his fault. He will get better. Its ok for him to ask for help. Therefore, show the man some support and don't criticise him for being ill and needing to come home - he didn't do it just because England are losing. Replace the words "stress related illness" with "cancer" or "diabetes" or "broken leg" and people's views change - because they are physical things that are more accepted - not brain related. Not sure what needs to happen for the stigma to break - are we edging nearer / closer or are we still miles away from the acceptance and understanding of mental illnesses? I do hope we are near. I won't stop blogging / tweeting / ranting until that day arrives.